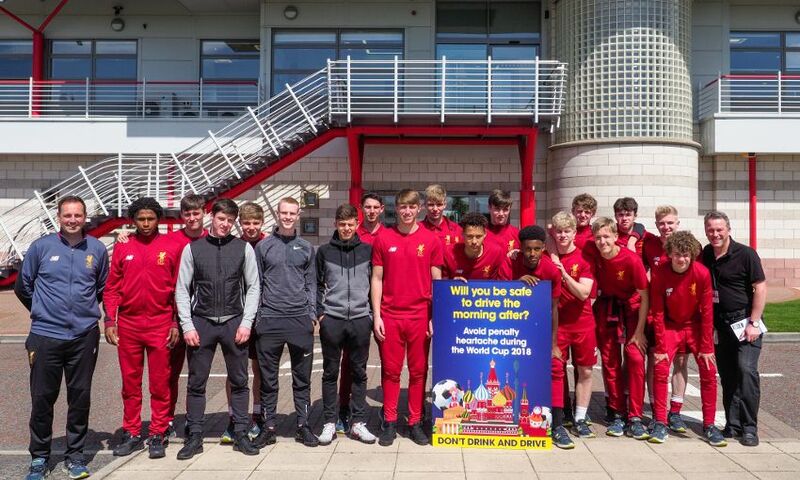 As the World Cup approaches, Liverpool Football Club's Academy has joined up with Knowsley Council's Road Safety team and Merseyside Road Safety Partnership to highlight the dangers of driving the morning after drinking alcohol. The campaign was launched with players from the Reds' U18 side, who took part in an interactive session aimed at highlighting the effect that alcohol can have on people's reactions. Many people will enjoy a few drinks as they watch the football and most wouldn't even consider getting into their car and driving afterwards. However, there is a real risk that people who would never deliberately drink and drive may still be over the limit, or unfit to drive, 'the morning after'. This is because it takes a lot longer than most people think for alcohol to pass through the body. On average, it takes around one hour per unit of alcohol, though this can vary depending on a number of factors. Councillor Tony Brennan, Knowsley Council's cabinet member for regeneration and economic development, said: "We know that many people will have a drink while watching the football and we want people to enjoy watching the World Cup. "The aim of this campaign is to make people think about how much they are drinking if they are planning to drive the following morning, as they may still be over the limit or unfit to drive. "You could be driving to work or going shopping and still be over the limit. You could even be driving your children to school and still be unfit to drive. Could you live with yourself if something happened? "We are encouraging drivers to be aware of how long alcohol stays in the system so they can enjoy the football without putting lives at risk on our roads the next day." Merseyside Road Safety Partnership features local authority members including Sefton Council, St Helens Council, Wirral Council, Liverpool City Council and Knowsley Council, as well as additional partners including Merseyside Police, Merseyside Fire and Rescue Service, Merseytravel and Highways England. Station manager Steve Pang, spokesperson for Merseyside Road Safety Partnership, said: "The decision to get behind the wheel of a vehicle the morning after drinking can have very serious consequences, not only for the driver but also potentially for other road users around them. "We would encourage people to enjoy watching the tournament but to remember that your safety and the safety of others is vital. If you have been drinking the previous evening and are thinking about driving the next morning, don't take that risk." Paul Mountford, Merseyside Police's lead for drink and drug driving, said: "Merseyside Police will be conducting numerous roadside operations and breath and drug testing hundreds of drivers across Merseyside throughout this campaign to ensure that drivers understand the principles of this campaign – that the only safe drink drive limit is zero. "Many drivers are unaware that even a small amount of alcohol may affect their driving ability, placing them at an increased risk of a crash and arrest. They may be arrested for 'drink driving' even if they pass a breathalyser if the officer considers them to be unfit. This is particularly relevant the following day when many will not consider their driving fitness after a night's sleep. "We are also reminding drivers that we will not tolerate those who take illegal drugs and drive. Similar to alcohol, driving while under the influence of illegal drugs can place the driver and other road users at risk. Our roadside tests aim to not only detect these drivers but also deter them from getting behind the wheel." Phil Roscoe, head of education and welfare at Liverpool FC, said: "The session with the Road Safety team was really interesting and helped to raise awareness of the effects that alcohol can have on your body, even the morning after having a drink. "The message from the campaign is relevant at any time of the year, but it is particularly important to in the run-up to the World Cup to help people enjoy watching the tournament safely." The main message from the campaign is not 'don't drink', but 'don't drink anything if you are driving' and 'don't drink heavily if you have to drive the following morning'. To find out more, you can pick up your free World Cup wall chart in any of Knowsley's One Stop Shops or public buildings (available from June 1) before the first match on June 14. The 'Morning After' calculator helps you to add up the drinks you consumed the night before and gives you a rough calculation of when you may be safe to drive. Visit morning-after.org.uk for more information. You can also download the app to keep track of what you're drinking while you are out.